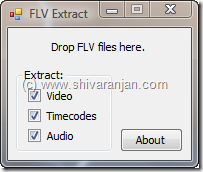 FLV Extract is a free tool using which you can extract audio and video files from FLV files. The other standard tools that are available will either decompress or recompress the FLV file for extraction of audio and video but FLV Extract does not decompress or recompress the extraction of audio and video. The video files extracted from FLV file is saved as AVI (H.263/FLV1 and VP6/VP6F) or raw elementary stream (H.264/AVC) file format and audio that is extracted is saved as MP3, AAC (with ADTS headers), Speex, or WAV (PCM). The output file format of audio and video files cannot be changed as it depends upon the data that is contained in the FLV video file. To extract the audio and video from a FLV file choose the options and then drag and drop the FLV file into FLV Extract’s window and the conversion will be done. This tool does not require any installation hence can be used a portable application and works with all versions of Windows but requires .NET Framework 2.0 and above.